Robbie Photo Gallery - Enhanced. CD Like New. My Way (Live At The Royal Albert Hall) 7.00. Eternity (Orchestral Version) 5.32. Robbie Williams. Enhanced CD Single. Let Love Be Your Energy. My Way (Live). Limited Edition. My Way (Live Film). Catalogue Number CDCHS5124. I am sorry but I cannot accept International Money Orders. Robbie Williams‎ Rock Dj. Rock Dj (Player One Remix). Rock Dj (Video). Remix –Player One. ROBBIE PHOT GALLERY. CD CONDITION : EX. FEEL - ALBUM VERSION. 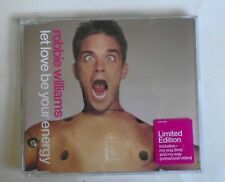 ROBBIE WILLIAMS - LET LOVE BE YOUR ENERGY (Limited Edition Enhanced CD Single). Let Love Be Your Energy. In excellent condition with just a few very light marks. With picture insert in a stickered slimline case. CD CONDITION : NEAR MINT. MY WAY - LIVE. MY WAY - LIVE FILM. CD CONDITION : EX. MY WAY - LIVE AT THE ROYAL ALBERT HALL. Records advertised as Sealed or Unplayed should be Mint. The cover and contents suffer from folding, scuffing of edges, spine splits, discoloration, etc. Format: CD, Single, Enhanced. POOR: The record will not play properly due to scratches, bad surface noise, etc. My daughter is having a cd sortout and she no longer listens to this one. Its in good condition with a few small scratches on the cd and cover but it works fine. I have more to list. With glossy picture insert in a stickered jewel case. The insert has a couple of light clip marks. Robbie Williams. Strong (1999). The Largest Collection in Germany. Second Hand and New. Here you may buy music at very low prices. Robbie Williams. AND WE WILL TRY OUR BEST TO GET THEM FOR YOU. 1 Rudebox (Album Version) (3:51). Video 1: Rudebox (3:50). Video 2: Rudebox Interview Clip (1:34). I have more than a dozen Robbie promo & enhanced cd singles besides these (GBP 1. EX = A record that is clearly a used one but should satisfy most collectors. ). Robbie Williams - Sing When You're Winning. Special Collectors Edition. The cover and contents suffer from folding, scuffing of edges, spine splits, discoloration etc. CD ROM Photogallery. Better Man 3:22. CD CONDITION : EX. GET A LITTLE HIGH. PHOTO GALLERY. CD in average/heavily used condition with inlay. Strong 4:40. Happy Song 2:54. ROBBIE WILLIAMS - NO REGRETS (Enhanced CD Single Part 2). No Regrets. No Regrets (Video). In excellent condition with just a few very light marks. ROBBIE WILLIAMS - " ESCAPALOGY". ORIGINAL CD / NEW SEALED. Artist: ROBBIE WILLIAMS AND NICOLE KIDMAN. Label: CHRYSALIS. Format: CD. Robbie Williams. Don't Do Love. AND WE WILL TRY OUR BEST TO GET THEM FOR YOU. Chrysalis ‎– CDCHS 5107,Chrysalis ‎– 7243 8 86803 0 1. Robbie Williams ‎–Strong. Pop Rock ,Synth-pop. 22 Mar 1999. CD, Single, Enhanced. Disc and inlay appear as new - case is scuffed and scratched from storage. Robbie Williams - Rudebox - CD Album DVD. 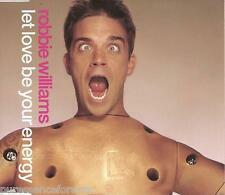 Artist: Robbie Williams Label: Chrysalis Catalogue #: 3770632 9. Booklet Included. Discs housed in paper inner sleeves. The Boring (but important) information. Robbie Williams - Strong - CD Single. Artist: Robbie Williams Label: Chrysalis. Country of Origin: United Kingdom Year of Release: 1999. Title: Strong Format: Compact Disc. Inlay / CD Condition: Ex/Ex Catalogue #: CDCHS 5107. We are professionals with extensive experience. Any doubts you may have and guide you in the best way possible. You can get in touch. We are located in the Centre of Vilanova i la Geltrú. 08800 Vilanova i the Geltrú. Robbie Williams - Tripping - CD Single. Title: Tripping Format: Compact Disc. Tripping (Album Version). Artist: Robbie Williams Label: Chrysalis. Country of Origin: United Kingdom Year of Release: 2005. Morning Sun. Morning Sun (Reprise). Won't Do That. Difficult For Weirdos. My way ~ live. rolling stone ~ live. my way ~ live film. The CD number: 724388979009 The CD is in mint condition and sealed. Don’t do love. Robbie Williams. Reality Killed The Video Star. · This is anOFFICIAL, GENUINE CD ALBUM. · NEW & SEALED. · Actual item for sale is shown in the photograph. We have this item ready for despatch now! Robbie Williams - She's The One - CD Single. Artist: Robbie Williams Label: Chrysalis. Title: She's The One Format: Compact Disc. She's The One (Video). She's The One. Country of Origin: United Kingdom Year of Release: 1999. Robbie Williams - Sing When You're Winning Special Collectors Edition released in 2000. REALITY KILLED THE VIDEOSTAR. ROBBIE WILLIAMS. Hier folgende CD / Here following CD Morning Sun Reprise. Won't Do That. Difficult For Weirdos. Do You Mind?. Format: CD, single, enhanced, CD2. Title: ROBBIE WILLIAMS she's the one. ROBBIE WILLIAMS Reality Killed The Video Star ​Enhanced CD THIS IS AN ORIGINAL 2009 EU RELEASE Tracks 1 Morning Sun 2 Bodies 3 You Know Me 4 Blasphemy 5 Do You Mind 6 Last Days Of Disco 7 Somewhere 8 Deceptacon 9 Starstruck 10 Difficult For Weirdos 11 Superblind 12 Won't Do That 13 Morning Sun (Reprise) ​ CD: EXCELLENT INSERTS: EXCELLENT. All in all, SING WHEN YOU'RE WINNING is an ambitious and highly entertaining piece of work. These dimples run decreasingly through to the back page. Love Calling Earth. Rolling Stone (10/26/2000). If It's Hurting You.